Himalayan Salt Crystal: The world's only natural ionizer and air purifier. These 250 million year old 'Natural Crystal Salts' are obtained from specific mines within the Himalayan Mountains. They are hand chipped & hand crafted and made with the care and pride of a centuries old tradition in salt carving. 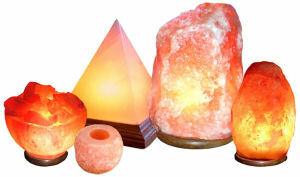 Create a relaxing environment and melt away stress by adding genuine Himalayan Crystal Salt Lamps in your favorite rooms. Reduce the stress of electronic devices by balancing the positive and negative ions in the air. Negative ions are widely recognized to alleviate a variety of common conditions, including asthma, allergy and other respiratory ailments, sleep disorders, migraine headaches and flu. The low level lighting can actually save you money by eliminating the need for brighter overhead lighting in the evening hours. These crystals will never reduce in their shape, size, weight, color or ionizing effects! !